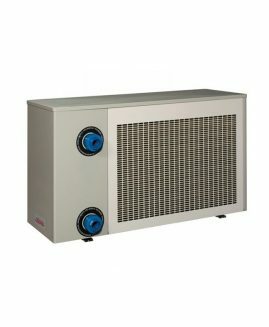 Air/water heat pump to heat you pool in the cheapest possible way. Private pools up to 80 m3. This technology makes it possible to extend the swimming season to enjoy your pool more months of the year. Its ability to extract air energy means it can obtain up to 5 times the energy it consumes, delivering low consumption and making it more environmentally friendly. • The heat pump with the best quality/price ratio in the market. • EVOLine is especially designed for the climates where it will be used, ensuring great energy savings for low temperatures. • The greater the COP, the bigger the energy saving and the lower the energy costs. EVOLine pumps have oversized parts such as: Evaporator and Titanium A1 two coil exchanger. • Free app ready to download to control the heat pump via wifi. • Minimum air working temperature 0ºC. • Heat and cold regulation to keep temperature steady. • Digital control, leak-tight control box. • High and low pressure pressure switch.